It's a very lonely island, about, well, about Midway between California and Asia, and about 5 degrees north of the Tropic of Cancer. Home of the 'gooney' bird, Midway is 1,304 miles (2086km) west of Honolulu, and 1,182 miles (1891km) east of Wake Island (where? Wake is another story!) which in turn is 1,500 miles (2400km) east of Guam. Yes, it's a very lonely place. The Commercial Cable Company established a small outpost there near 1900, as the first trans-Pacific submarine cable reached the island, which formed part of the very young Territory of Hawaii. 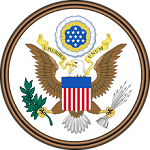 The US had just taken possession of Guam and the Philippines after the US-Spanish War, and the northern Pacific was an area of growing US influence. On Midway, the small cable staff shared the island with hundreds of thousands of gooney birds (albatross) and other bird species, and the island was declared a bird sanctuary. In early 1935, a hotel, restaurant, power generator and the other makings of a tourist resort appeared from the east on a cargo ship and were quickly rebuilt on the island. Sister flying boat 'China Clipper' heads for water at Alameda, CA, 1935. Photo © Harold See, in 'Flying the Pacific', The National Geographic Magazine, Vol LXX No.6, December 1936. A tourist resort? 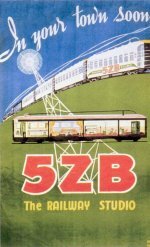 The Pan American Airways Company, having succeeded in breaking the isolation of Latin America with its luxurious flying clippers, now turned its attention towards the Orient. During 1935, a series of test flights were made with giant China Clippers to pave the way for a new air service from San Francisco (Alameda Bay) to Manila via Honolulu, Midway, Wake, and Guam. Midway was already being touted as a tropical island stopover on this romantic air route, and all the comforts of home appeared on lonely Midway. The service began some 70 years ago, on October 21, 1936 and ended abruptly with the Japanese declaration of war less than five years later. Sister flying boat 'China Clipper' in-flight, 1935. Photo © Pan American Airways System, in 'Flying the Pacific', The National Geographic Magazine, Vol LXX No.6, December 1936. 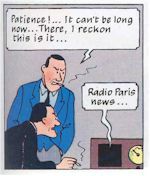 The first broadcast from the island took place in December 1935. The very second China Clipper service from San Francisco carried a reporter and engineer from the US radio network The National Broadcasting Company (NBC) on a mission to test recently developed shortwave radio equipment for long-distance reception. 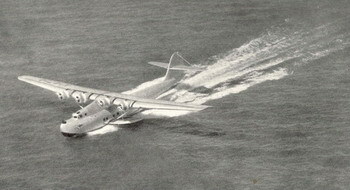 William Burke Miller and Harold See made a number of SW broadcasts from aboard the 'Philippine Clipper' as it flew on the 58 hour journey from San Francisco to Manila. These included interviews with PAA flight personnel, staff at Midway and Wake, and their own descriptions of the flight as it made its way westwards. 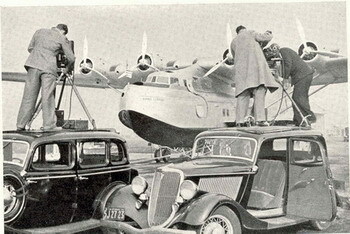 The SW broadcasts were relayed over stations of the NBC network, and were made from inflight as well as from aboard the clipper at anchor in the Midway lagoon. The callsign assigned for these SW broadcasts was WOEH. The American Forces Radio Service opened a low power AM station on the island as part of the Pacific Ocean Network under US Navy control. The station came on air after the famous Battle of Midway, which began a series of reversals for the Japanese military. The callsign was allocated as K M(idway) T(erritory) H(awaii) in line with the K prefix in use in Hawaii for mediumwave stations, and distinct from the WX and WV prefixes generally used by other AFRS stations in the Pacific area. 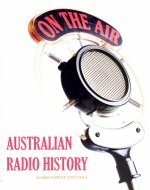 KMTH used the frequency of 900 kHz and the very low power of just 5 watts, and began broadcasting in September 1944. This co-incided with a period of rapid AFRS expansion as allied forces began preparations to advance on Japan. 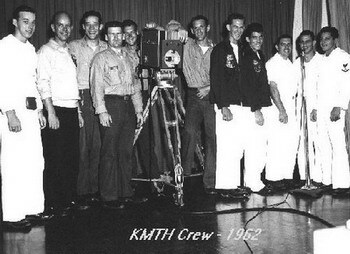 By 1956, KMTH had increased its power to 250 watts and moved to 920 kHz, providing entertainment for US forces on the island, which played a role as a staging post for USAF airlift capability to the Far East (in particular occupied Japan and during the Korean War). 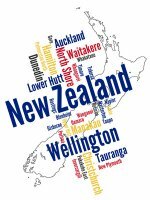 New Zealand DXers were hearing the station regularly, and the personnel at KMTH dedicated a special program to their Kiwi audience thousands of miles away and almost due south. 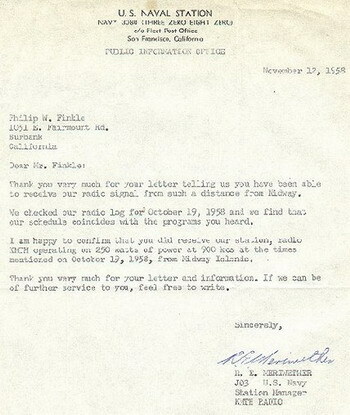 During July and August 1956, we received 21 letters from listeners in New Zealand who've been able to pick up our radio station KMTH here on Midway Island. We here at Midway haven't had the experience in the past of having so many people write for confirmation. Therefore, we don't have QSL cards so I hope this form letter to you all will be acceptable. Each and every letter I've received has been correct as to the broadcasts that you've received. I'll give you a run down of the schedule here at KMTH so if you hear us again in the future, you'll know it's KMTH. For the past two months we've been on what is known as Daylight Saving Time. This time has put us on air at 5am in the morning, your time down there in New Zealand. Starting September 2, 1956 we'll again go back to Standard Time. This'll mean that we'll go to air at 6am your time. From all reports our signal has been fading about 20-35 minutes after we've gone to air. I feel now we've gone back on Standard Time, it'll be difficult for you to pick up our signal. Each day, Monday-Friday we start our broadcast day with the same opening theme. This theme advertises the fact that we're one of the many United States Armed Forces Radio Stations. Following our theme on those week days, we have the Island Chaplain for approximately 10 minutes with a daily prayer and devotions. Following the Chaplain, we have 35 minutes of march music or popular tunes. This is left to the choice of the announcer. On Saturday mornings, we have the Top of the Morning Show. The announcer has been Lou Schuster. Many of you listeners have heard him. I enjoyed very much putting on the special broadcast for all of you fine people in New Zealand. I only wish I was going to be here on Midway Island so I could do it again. I heard the tape recording that Ken Mackey sent from Dunedin. It certainly was a shame that there was so much static. If you'd like the fellows here at KMTH to try another special broadcast, just write and name the date, and they'll be more than glad to do it for you. It's still so wonderful to know that we've been heard so far from here, and with only 250 watts of power. I'm sending along some literature about Midway to people in different cities that I received letters from. Since the supply is limited, I hope they'll be passed around. Well friends, that about does it. May I thank you all once again for your letters, and hope that this will confirm all those letters. From myself and all of the announcers here at KMTH....GOOD LISTENING. When I was assigned to Midway, it was a Naval Air station, Just before I arrived, it had also housed a Naval Communications Station, which was then relegated to the Communications Division of the Air Station. Although we could hear West Coast USA and Hawaiian radio stations from time to time, our main source of radio and entertainment was KMTH, which like the USO shows, gave an illusion of contact with the real world. The KMTH studio was a reasonably well-equipped space for those days. The broadcast booth was about 12' x 12' and was set in a larger space that included a vast record library that covered everything one might need. We were a 24 hour operation, with the equipment maintained and operated by the CommCenter. The music played depended on who was in the booth! We had at least one guy who was an AFRTS rate and he did Top 40 in the daytime as I recall. Other than that, the majority of the play was Country and Soul. The only time any real music was played was during my shift from midnight to 0600! I called my show 'Music to Miss Your Girl By' and played standards, Broadway, some jazz, heavy on the ballads and love songs by all artists, but avoided anything remotely smacking of Country or Soul. I used to get a lot of nasty calls at night requesting that stuff, but I advised them to listen some other time! One of my last shifts was Christmas Eve 1970. I played nothing but Christmas music all night long and since the day guy wanted to slack off, I kept it going a few hours into the morning shift playing Boris Karloff narrating 'How the Grinch Stole Christmas' and other light classics. I also introduced the concept of trivia on the radio by reading excerpts out of the Guinness Book of Superlatives (later Book of Records), to a largely uninterested audience! 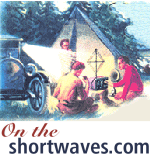 News came from our AP teletype feed, as well as AFRTS shortwave broadcasts from Los Angeles. Broadcasting on Midway was the same as broadcasting from any other size station. You play to one person, whether they're there or not! I got over to Japan once, when I mistakenly patched the KMTH circuit into the 40kW RLPA that was pointed that way at the time! Only once though! It was quite a thrill to find we have listeners in New Zealand. I can personally verify your reception as it was my show you taped! I use Paul Anthony as my air name which isn't really a fabrication, because my full name is Paul Anthony Vautier. My live show is from 0600-0900 Monday-Friday. GMT would be 1700-2000. Anyway, it was really a surprise to realize that our signal is that good - at least sometimes. We broadcast on 920 kHz with 250 watts. 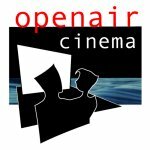 Right now we're broadcasting 24 hours a day, six days a week. The only time we're off is Sundays 1100-1700 GMT. 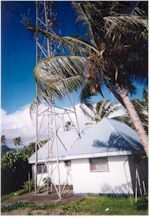 The AFRTS still keeps a small broadcasting unit on Midway, using 50 watts on the FM frequency of 94.0. The station no longer uses the callsign KMTH, ending the WWII link to the Pacific Ocean Network. In recent years, Midway Island has been re-opened to the public, and the Pan American Airways dream of some 65 years ago of a tourism resort is finally being realised. It's now an eco-tourism resort with regular flights from Honolulu by commercial airline service. However, visitor numbers are restricted to protect those gooney birds who've survived these years of China Clippers, Japanese bombs, and Country and Soul music from KMTH. 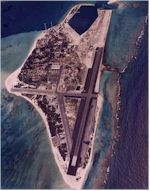 This article was originally written in 1999-2000 and contains information about the then current situation on Midway. 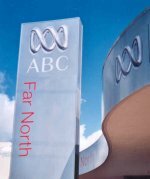 No radio station currently operates on the island. No eco-tourism business currently operates.